Sunita has just started at Coppergate School but has to be ultra-careful about making friends. She's scared someone will discover her horrible secret. Her worst fears come true when she makes an enemy of Celina, the class goddess, and Celina tells all their classmates that Sunita's dad is a fraudster on the run from the police! Sunita has to prove that she's no criminal herself and tries to keep her head down. But she can't hide her natural instinct for helping people and starts doing little favours for people without them knowing. Will more secrets mean trouble for Sunita? This book focused mainly on Sunita and Celina, who became enemies on Sunita's first day at Coppergate School, after Celina recognized Sunita from the news on TV and newspapers because Sunita's dad was on the run from the police. Sunita finally makes friends with Zara and Henry, and life seems to be much better for once. But then Sunita, Zara and Henry start doing secret good deeds for other people...but could that mean more trouble for them? 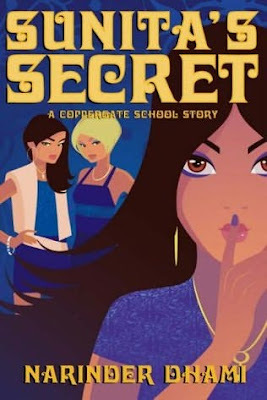 Sunita's Secret was written very well, and I loved the background of Sunita's life, which was carfeully weaved into the story without taking over the whole book. This book wasn't part of the Babes Series but the story was set in the same school and sometimes Sunita bumped into Amber, Geena or Jazz from the babes books. Sunita's Secret was very funny but also quite a serious story at the same time, which I felt was really good. The balance of funny and serious in this book was just right! I give this book 5/5 and if you've read the Babes Series then you will definitely love this!